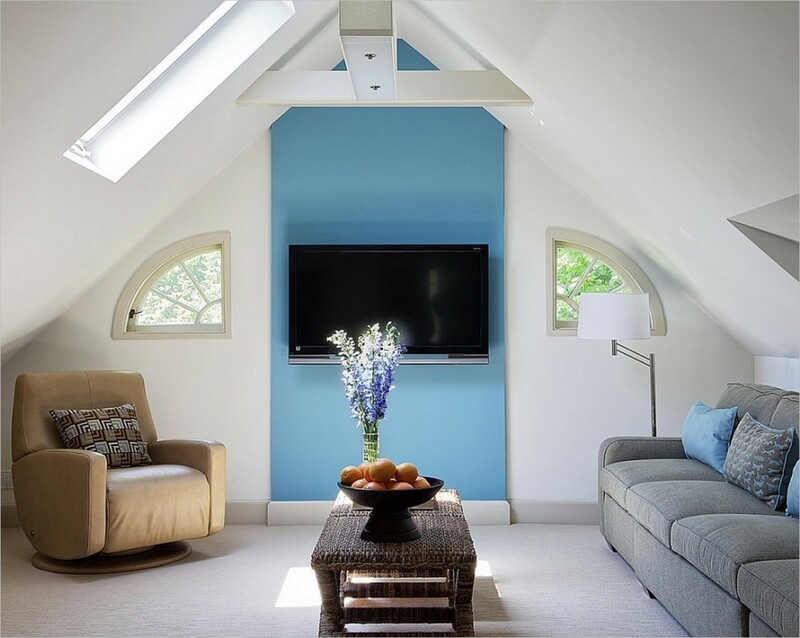 You are probably familiar with the ‘attic living room ideas’ craze. People all over the world are now utilizing their discarded attic space and capitalizing on the endless options it provides. And why not?! 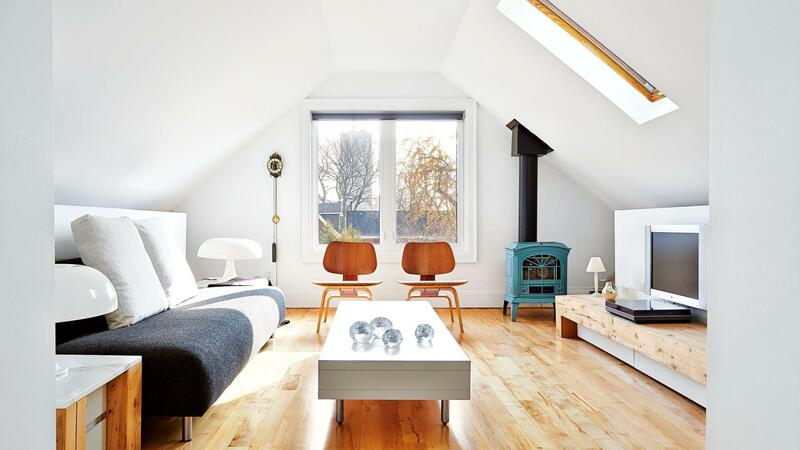 With some heavy dusting, a few coats of paint, and a keen eye for furniture placement you can transform your attic into just about anything. 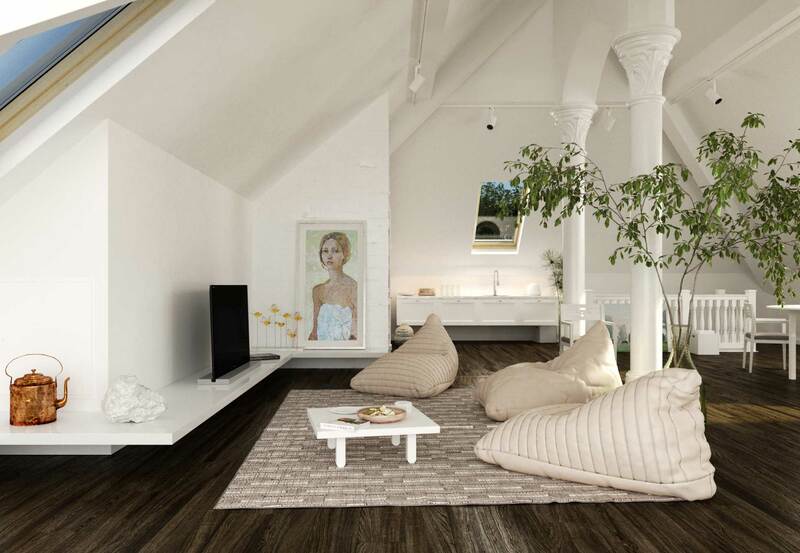 In-line with the contemporary tendencies in interior planning and design, the attic can be transformed in an ultimately cozy space where friends and family can spend time and have fun together. First off, the privacy it provides is priceless! On the other hand, the large open-plan space and the abundance of light allows introducing and positioning of any furniture set and building any desired interior to match the everyday habits and the aesthetic taste of the inhabitants of the house. It can be a young family’s retreat, furnished with a set of a small coffee table, a comfy sofa and a couple of sitting puffs, complemented by a soft carpet and matching lights. Or it can be a gentleman’s statement room, furnished in minimalist style with furniture items of clean lines and almost stern design. It can be a cozy nook for an elderly couple to relax, read a book or watch a favorite TV-show without being disturbed; or a youngster’s place to meet friends for a drink and have a party. The attic provides the excellent opportunity of actually having a second living room. Many would seize this opportunity to create an extra space for showcasing their extra ideas. So, open the roof by adding a skylight and you’ve got a gorgeous relaxing place to sit and gaze at the stars. 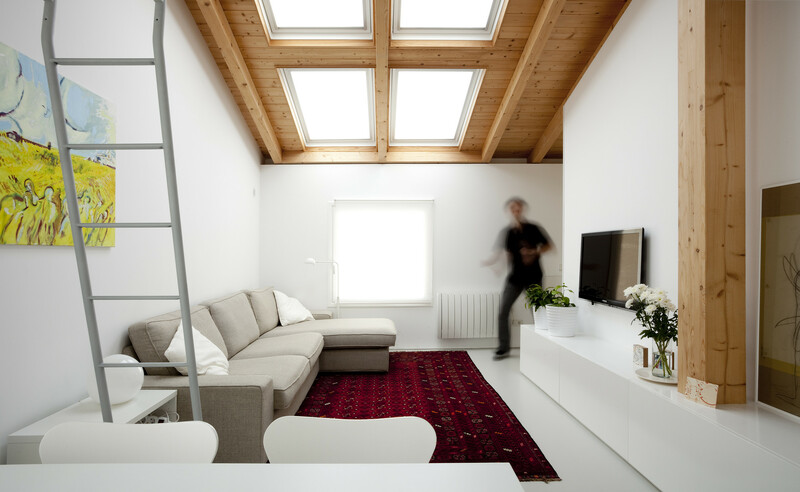 An elegant living room built on the attic floor. The sleek and modern minimalist interior in a predominantly white color palette features low profile furniture, which, together with the vertical wood paneling of the ceiling and layered lighting solutions, creates the optical illusion of a larger space. 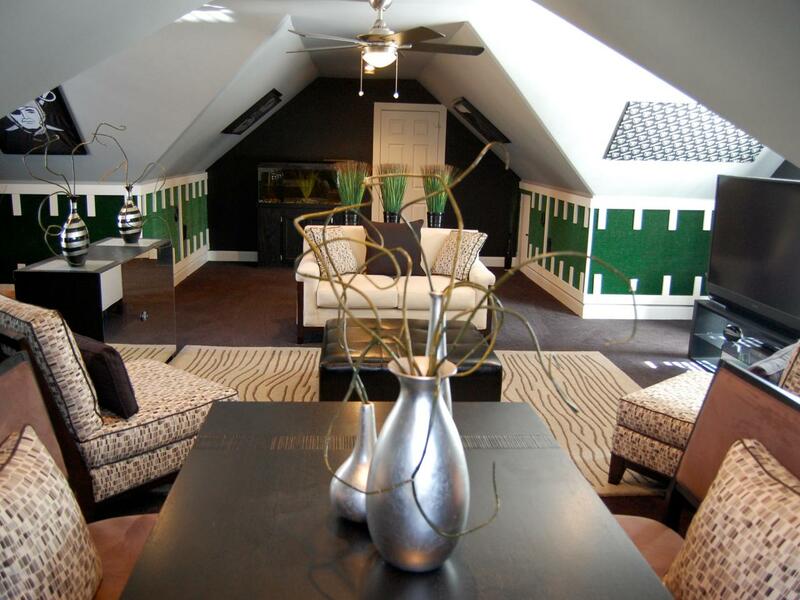 The interior in this small and cozy additional attic living room features a classical black-and-white theme, where a few accents in black and ink-blue catch the eye against the background of the light brown laminated floors, white walls, and soft low-profile furniture. A cozy relaxing nook. The small space under the house roof has been transformed into a personal haven, a place to spend a few hours alone, with an interesting book or just watching a favorite movie. The space is designed in an artistic style involving minimum furniture. An additional room for the man of the house, created on the attic floor. Minimalistic style, soft grey tones and contemporary art create a cozy personal space to relax alone, or to invite a couple of friends over for an exciting evening experience. 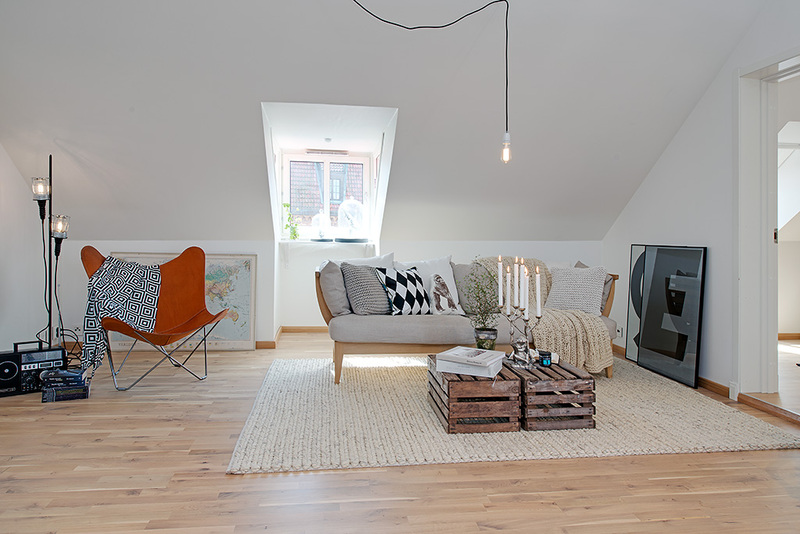 A Scandinavian villa attic floor converted into an additional personal space for work and relaxing. The skylights reveal beautiful views to the fjords while the interior glows in white and features a subtle mixture of Scandinavian and vintage design touches. The tower attic. Under the ‘pointy hat’-like roof dome of a tower crowning the top of an old building, the home owners of the top apartment have created this elegant living room. The space benefits of 4 meter high ceiling and features Gothic shaped windows adding originality and charm to the interior design. 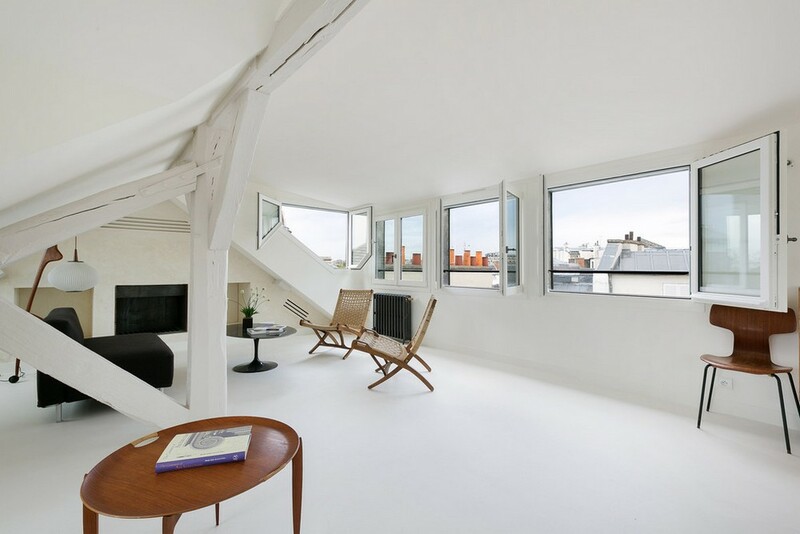 The second floor of a modern two-level apartment located on the top floor of a 19-century apartment building in the heart of Paris, France. The interior design of the space features a minimalist style with a warm Swedish feel, and is complemented by windows on all four sides revealing stunning views of Paris. A comfortable small room for relaxing and self-time. To achieve maximum functionality and use the headroom available in the best possible way, storage has been built into the eaves, behind specially built floating partitions, complemented by indirect lighting and modest interior solutions. 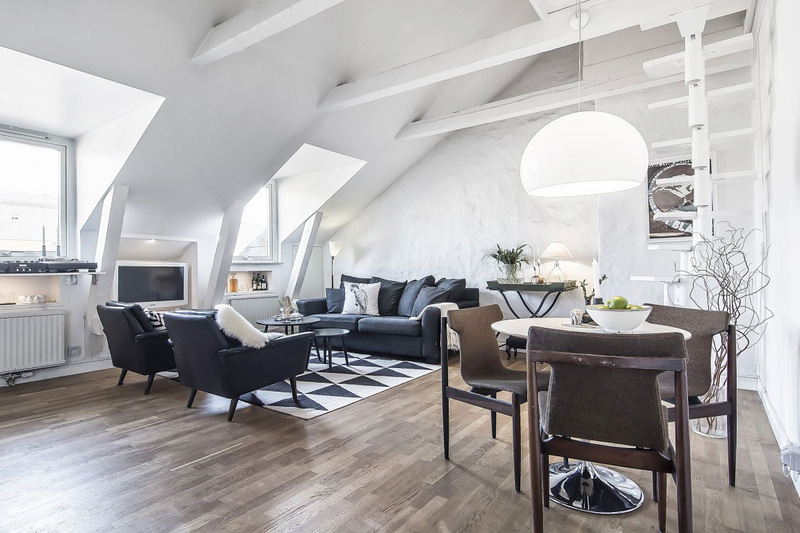 The upstairs of a two-level flat in a building located in the Gamla Stan’s cultural quarter of the old town of Stockholm, Sweden. It features an open space plan with a sloping roof, six skylights, and four dormer windows, with low sills and exposed rafters. It accommodates a lovely sitting area including a small modern kitchen, a dining area and a living room designed in a contemporary style. 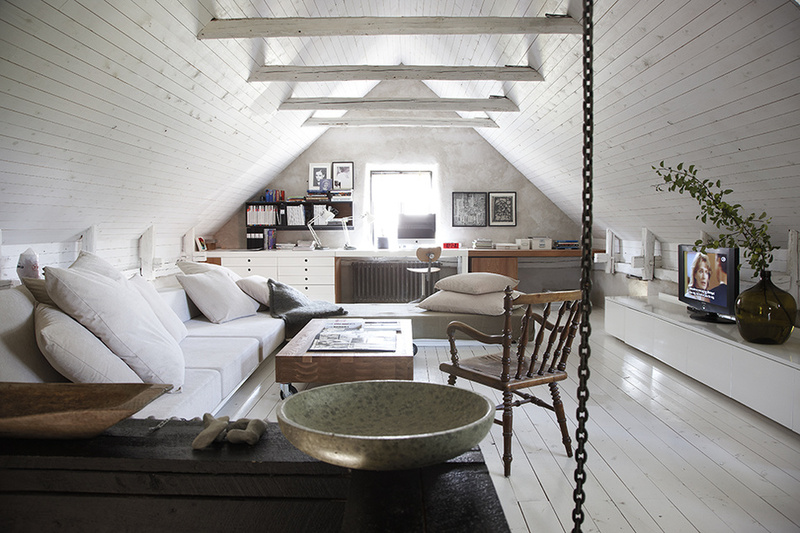 A small but superbly designed home in the attic. In spite of its modest size of only 42 square meters, this cozy flat is highly functional, exploiting every inch of the available space, with ingenious storage solutions and highlighting of every detail. It can serve as an excellent example that little residential space can be comfortable and appealing. The open-plan space is designed as a two-bedroom apartment with a kitchen, and features a smart layout and skillfully selected décor. A spacious and light loft room for a teenager. 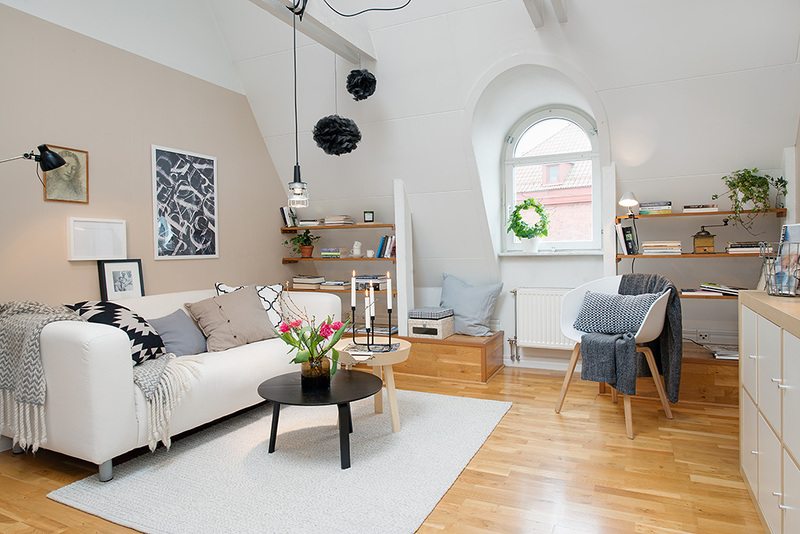 The interior design follows the typical for the Nordic styles features – a high ceiling with exposed beams, sloping walls and a polished floor, all in white, as well as a contemporary minimalistic style of the furniture, and smart storage solutions. A cozy private space designed with creativity and exquisite aesthetics. The room reveals expert understanding and appreciation of architecture, layout and interior design, through smart utilization of space, natural light, color and textures, to achieve a perfect blend of functionality and graceful style. An original layout solution for a living room. When the space is not enough to accommodate all the living areas necessary for a young family with a baby to live comfortably, it is time for finding smart solutions. This cozy nook serves as a living room, where every detail has been carefully considered from the p.o.v. of functionality. 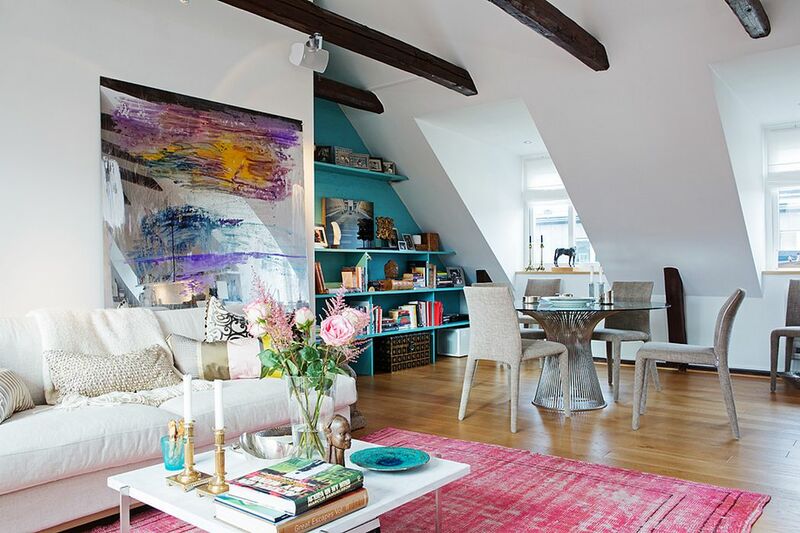 A spacious and bright loft apartment. The vibrant sterile-white walls are paired with exposed roof beams in contrasting dark, light brown floor laminate, and a storage nook in terracotta-blue. Soft pastel shades appear on large wall art pieces, as well as on the carpet, some accessories and textures to create a somewhat eclectic-style and fine taste. A loft home office and a living room in a relaxed and personal style. The Scandinavian interior features the typical blend of white and grey used in a perfect harmony with natural materials to create a tranquil atmosphere. A stylish and cozy relaxing room under the roof. 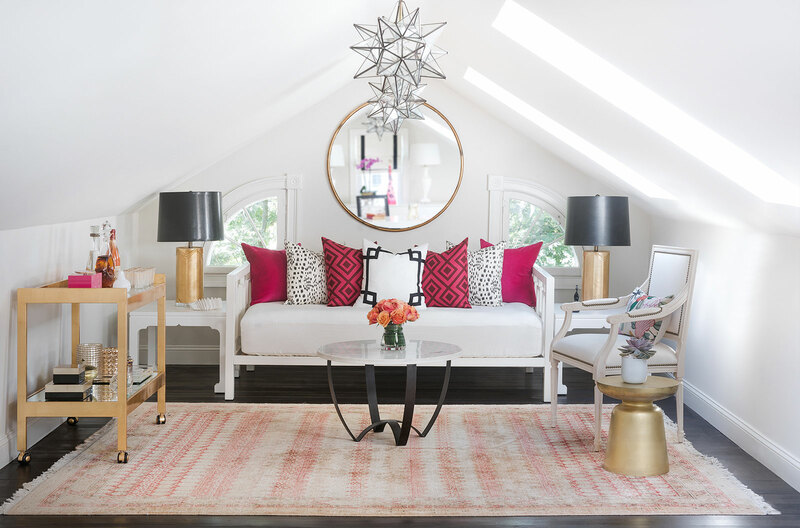 The small space is visually expanded through the use of bright soft colors, wall and skylights for natural light, and textures in neutral tones. An attic studio apartment in a contemporary shabby-chic style, accommodating a cozy living room, a small bedroom and an office. The interior pays homage to the old but features modern elements, a tendency to take into account for its elegance, its look to the past and its beautiful pastel colors. The walls are painted in white to give amplitude to the space and to serve as background to all the other interior components in a subtle combination between contemporary and vintage. A luxurious living room. 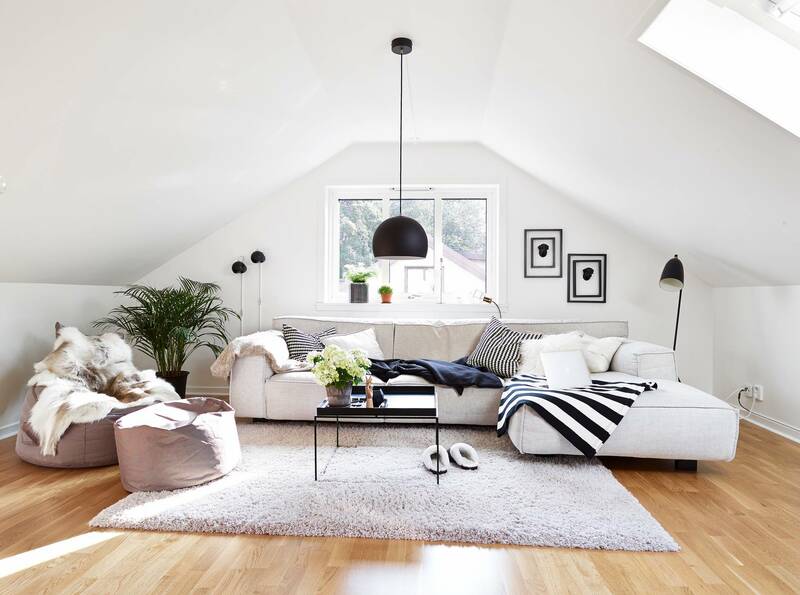 Designed in the elegant simplicity of the Scandinavian style, this attic living room offers a charming mix of traditional and more contemporary design trends. The white walls are contrasted with natural dark wood and leather accents, to create a peaceful and relaxing ambiance. 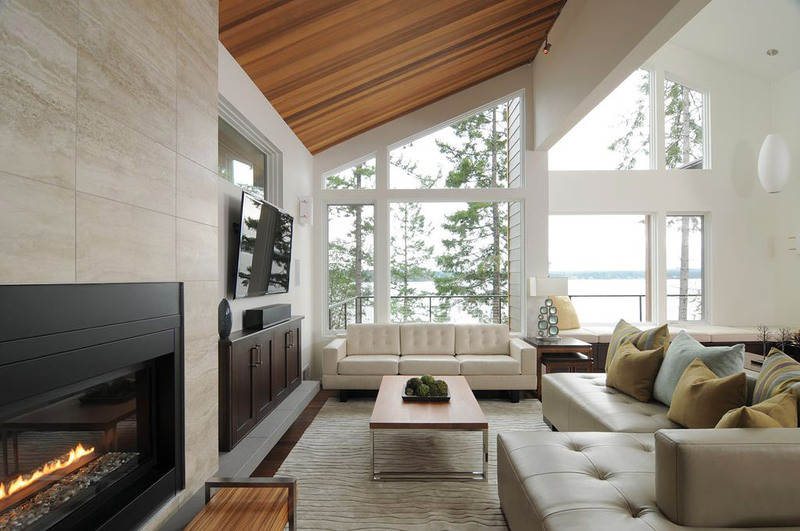 The contemporary built-in fireplace is a wonderful touch and provides a cozy feel to the room. A peaceful cozy nook to relax. Modern interior in bright colors and low-profile furniture delightfully combined with natural materials and contemporary art. Four roof windows provide soft natural light and romantic sky-view, while the dark red rug, the wood paneling on the ceiling and the exposed wooden beams add a warm coziness to the room ambiance. A charming personal retreat under the roof. The space is created to serve as both, a living room and a private self-time space. It benefits of a large double window letting plenty of natural light, while the somewhat vintage interior and pastel color palette create a cozy homey feel. A living room with a bohemian touch. 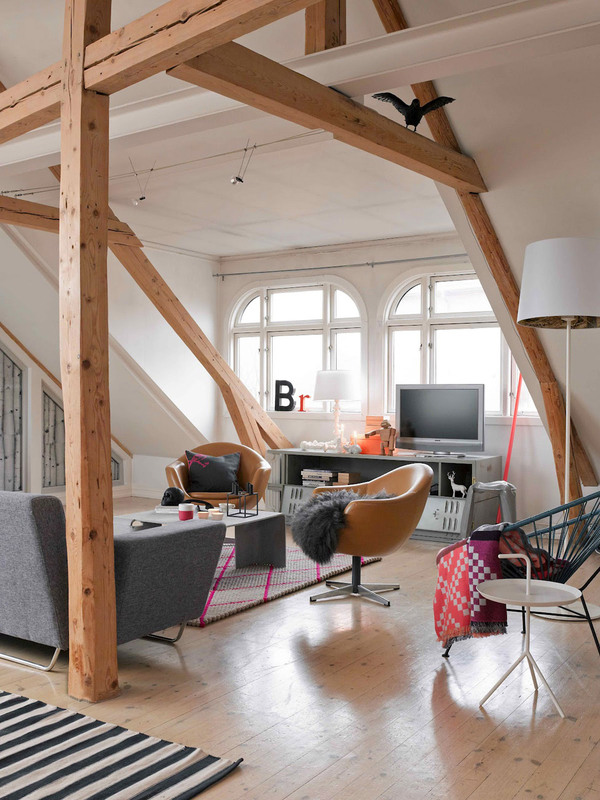 This loft room charms with its interesting interior featuring a mix of design styles. From Scandinavian ceiling and color palettes, through eco-styled wall decorations, furniture items in the style of the 50-s of the past century, up to textures in exotic colors and decorative items of modern kitsch, this whole cacophony of styles surprisingly comes together in a harmonious and somewhat free-spirited bohemian ambiance. A luxurious living room in classical vintage style with a rustic charm. 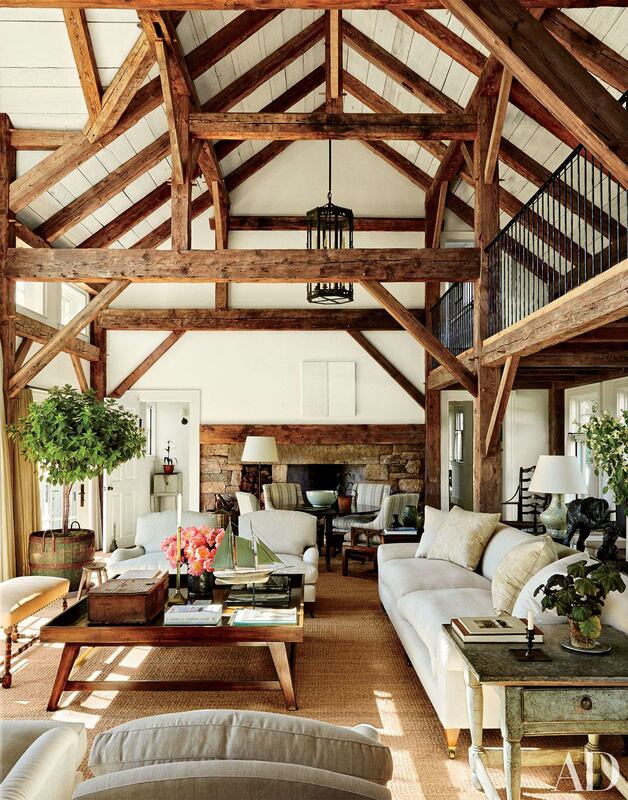 Exposed beams of reclaimed dark timber accent the barnlike high ceiling and shelter a vintage iron chandelier. An old open fireplace in a natural stone and wood paneled wall, recycled old furniture items, pastel vintage colors… This room is like a walk through time and generations! A modern living room with a statement. The space is entirely designed to celebrate the contemporary style of living. Each architectural and design solution here is a statement of the trends, tastes and aesthetical preferences of 21st century home owners. A peaceful retreat with a raw rustic charm. The small attic space of a country chalet is converted into a cozy personal space, featuring a back-to-nature rustic interior by boldly displaying raw and unvarnished wood, elemental textures, rough-cut natural materials and matching country-style furniture. 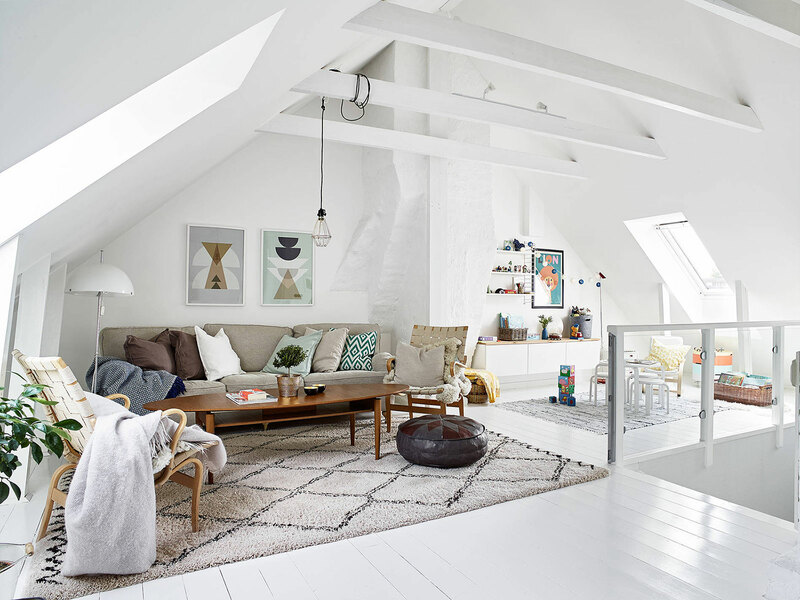 A bright attic family living room. With plenty of natural light streaming through a charming arched window, light colors and furniture of contemporary design, this living room is an ideal place for pleasant family time. 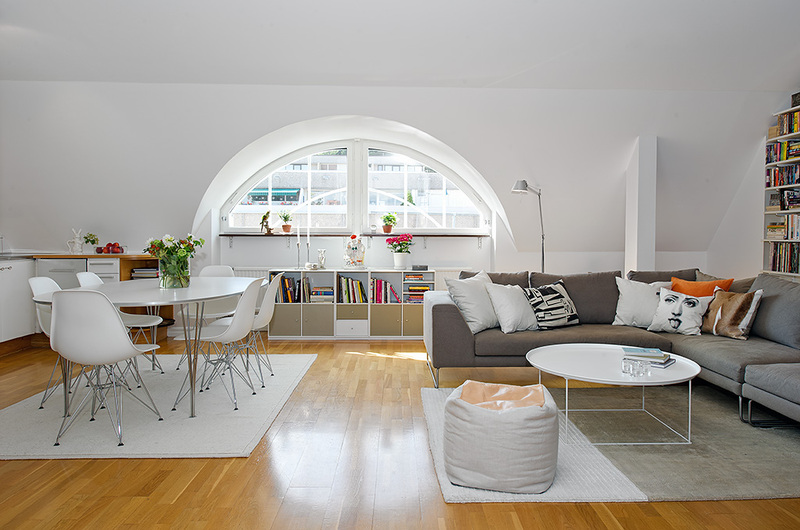 A cozy living room featuring Scandinavian simplicity and style. The room is designed in white and dove grey, and is furnished with carefully chosen furniture items, soft textures and stylish photography wall art, which creates a cozy environment, complemented by soft natural light streaming through the skylights on the sloped roof overhead. 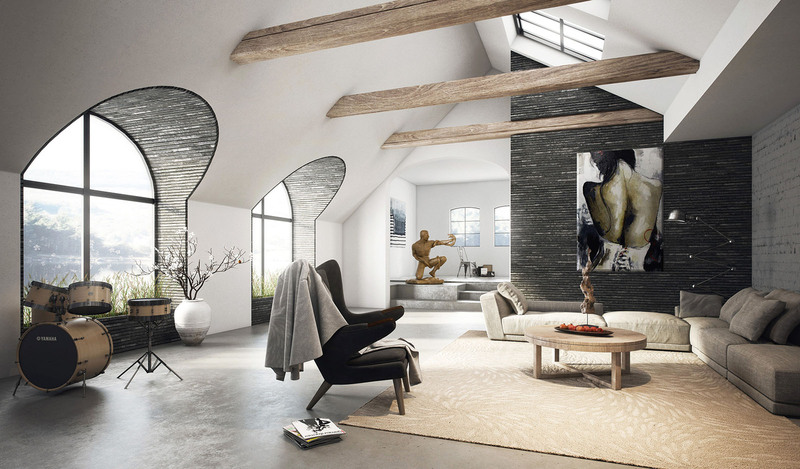 A comfortable living room in artistic design. An ambitious project to renovate and update a mid 19 century home has lead to creating this functional living room with a subtle design of artistic charm. To preserve the history of the house but still introduce a contemporary vibe, the designers developed the interior in contemporary clean lines and white color palette, while introducing some vintage furnishing. 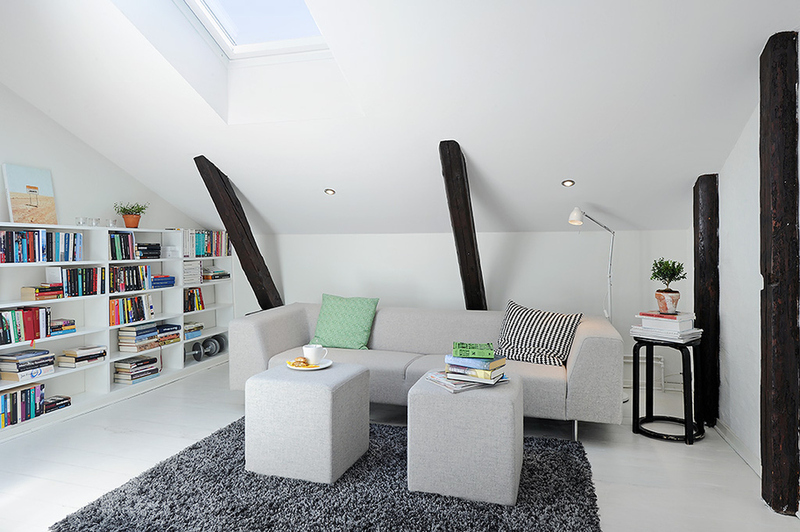 A splendid solution for converting an attic floor into a family living room with an open children’s play area. The open-plan floor accommodates a cozy living room for young parents and a kids’ playground. Both areas form one common space where the family can enjoy time together. A stylish loft living room in black and white. 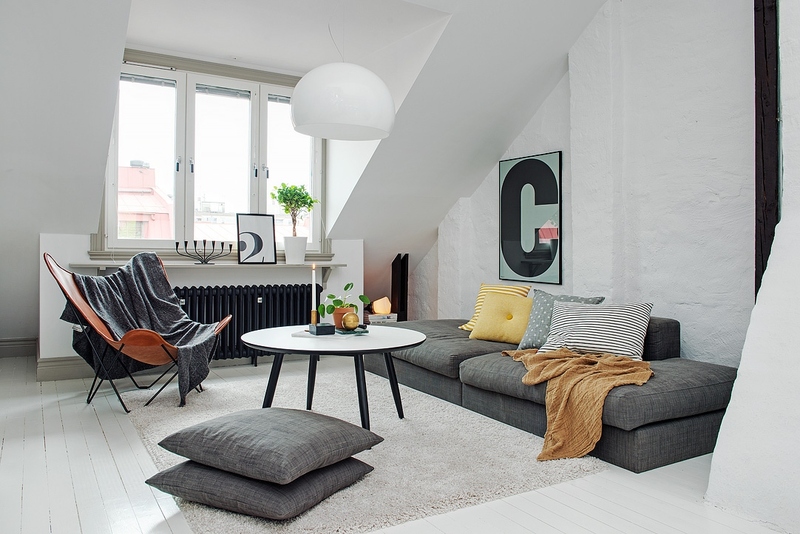 A spacious loft converted into a living room designed to create an almost casual yet stylish feel through introducing contemporary furnishing and B&W color palettes, typical for Swedish interiors. 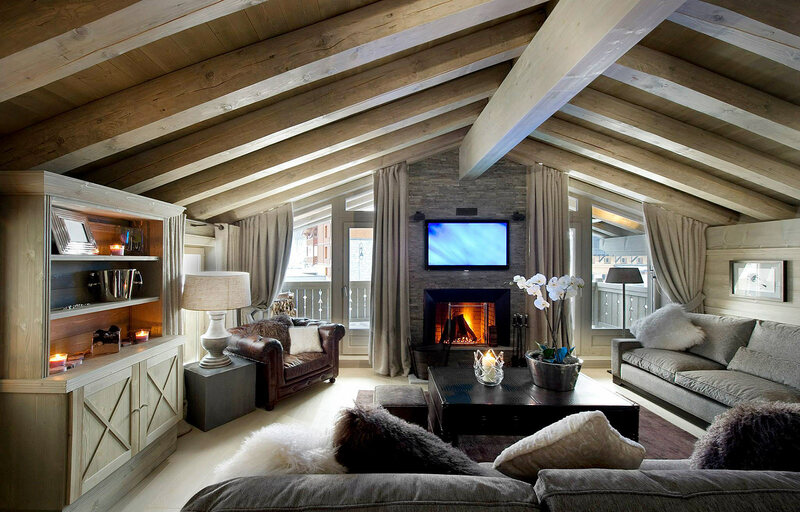 A charming chalet attic room. A little bit of vintage, a touch of rustic, and a couple of contemporary components, is the ‘recipe’ for creating this cozy attic room. 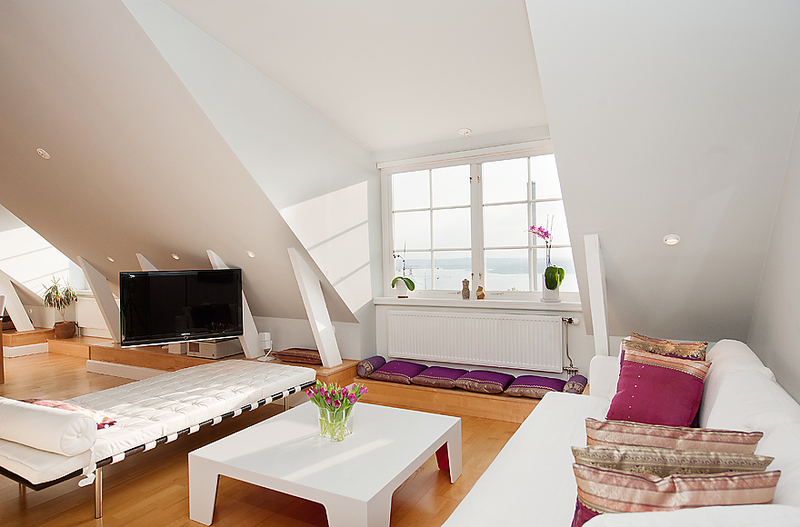 A stylish attic living room. The space features warm color palette in darker hues and some vintage touch, creating a perfect environment for relaxing. 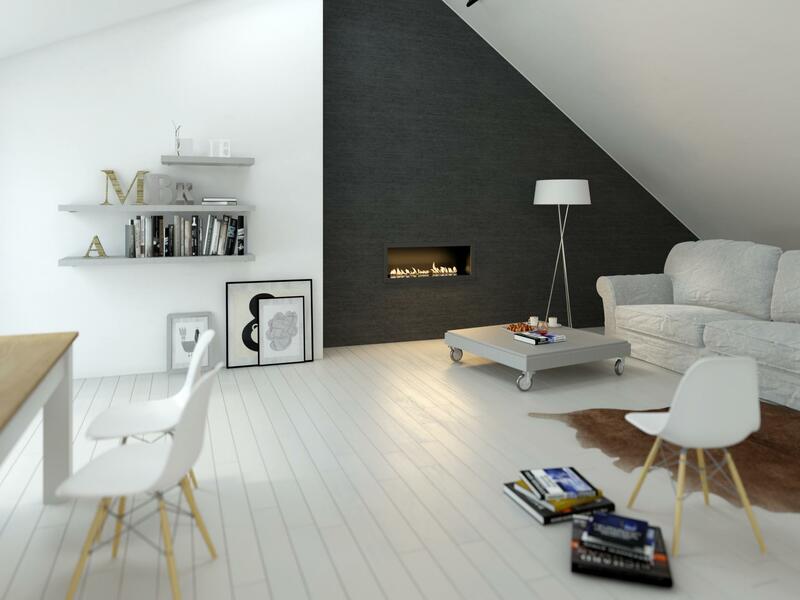 An attic living room with minimalistic chic. The space speaks of stylish taste through its minimalistic design, pastel colors and somewhat eclectic choice of furnishing. An attic with a view. 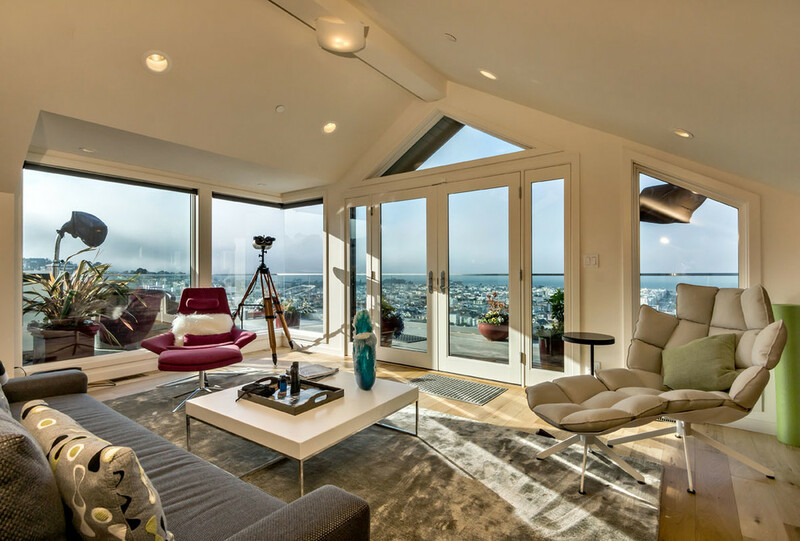 The space is dominated by large windows providing spectacular panoramic views and visually expanding the area. Only a few furniture pieces are introduced, intended to provide the necessary comfort while enjoying the view. A quiet private space under the roof. The angled roof and the limited space have provided enough room to create a cozy private retreat. 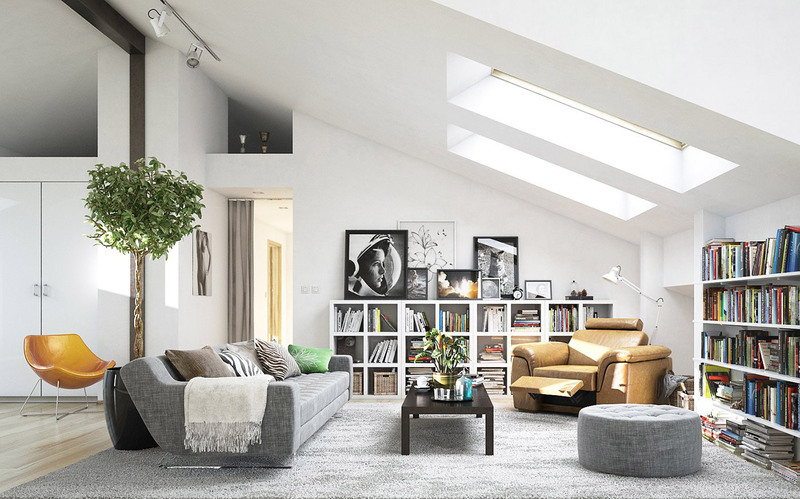 This attic living room is designed with taste and a touch of sports feel through introducing a ‘football field’ green area at the bottom line of the walls. 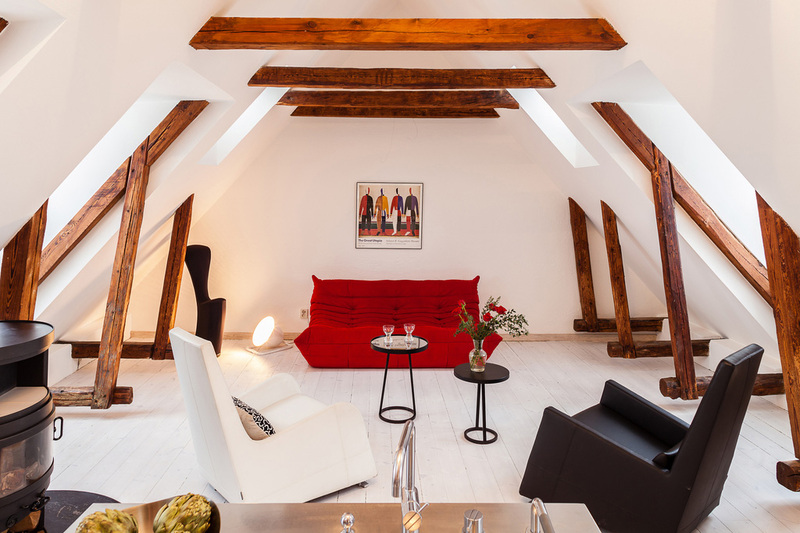 A boutique attic room. The attic space is developed to accommodate a small sitting area together with some space for playing music. The room features a stylish contemporary interior with an artistic touch. A great accent is the dark wood paneling of the windows arched frames continued onto one of the opposite walls. A cozy vintage attic room. This charming room is making use of every detail of the mountain chalet’s top level and features a warm and sophisticated interior. To meet the demand for both, luxury and comfort, it is beautifully furnished with designer materials and furniture with a stylish vintage touch. 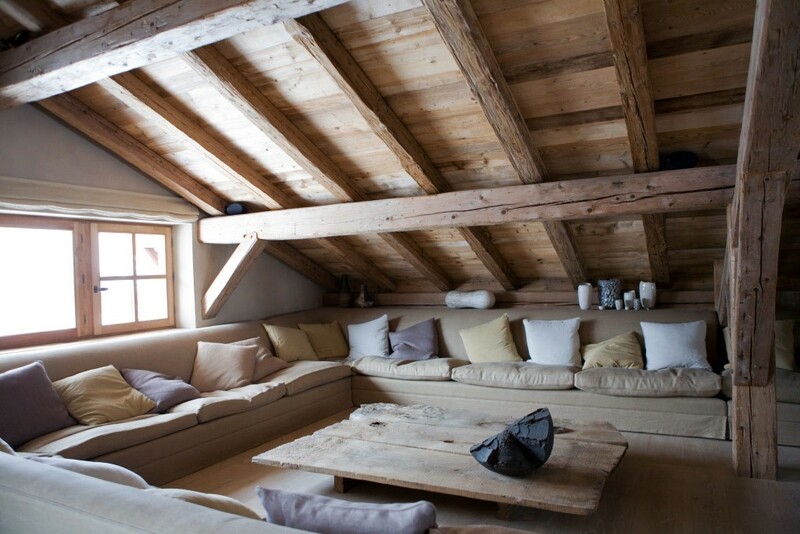 Rustic chic on the attic. 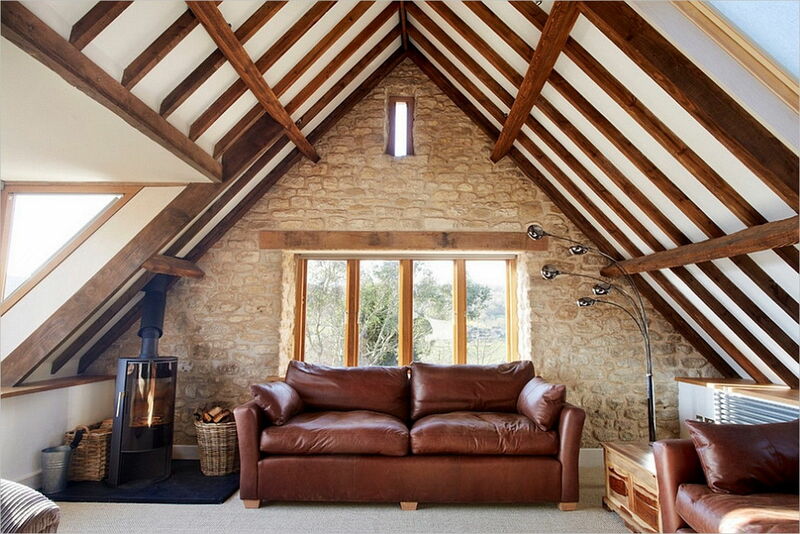 The spacious living room is designed to celebrate the charm of the relaxing environment of the rustic countryside. Natural wood rules the interior, complemented by a massive leather sofa, vintage elements and décor items, to create a warm homey ambiance. 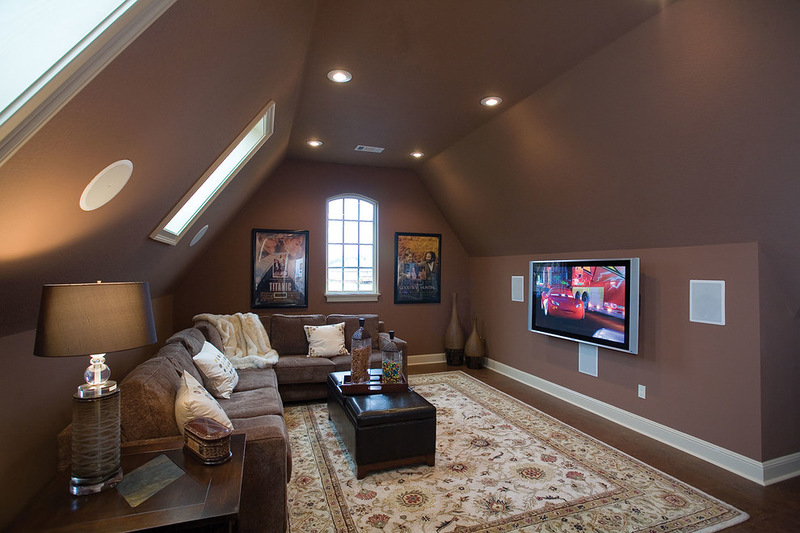 An attic media & living room. 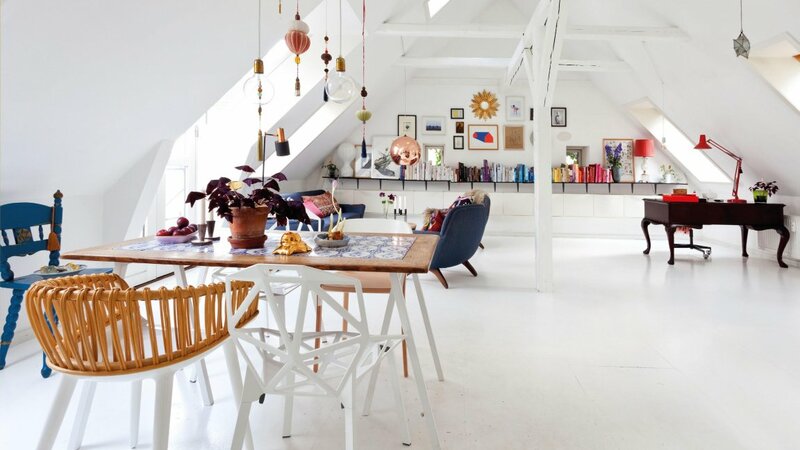 The bright attic has been converted into a funky multicolored space used for a media /living room to be enjoyed by friends and family. A carpet in tiled patterns in purple hues covers the floor wall to wall, while the custom-made sofa features fun multicolored sections that can be arranged and reconfigured and in various ways. A personal space with white elegance. A private room or a small additional living room, furnished to provide comfort and privacy. The interior is simple but elegant. 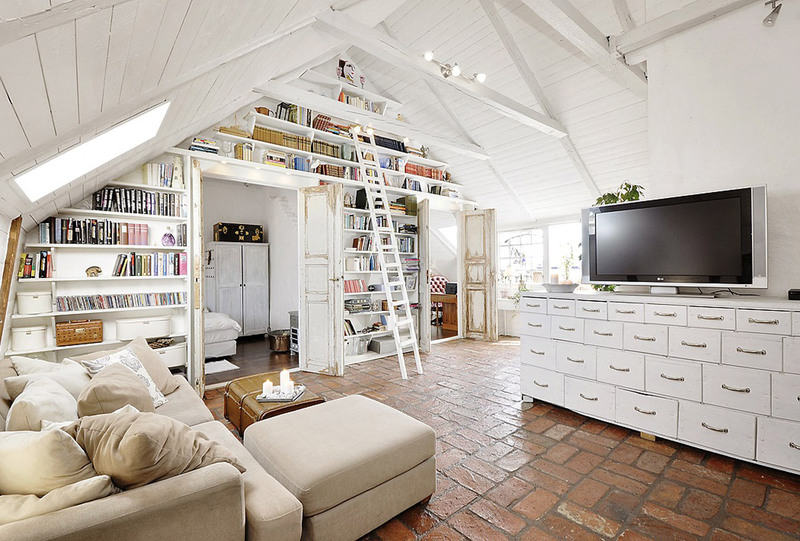 An attic apartment. 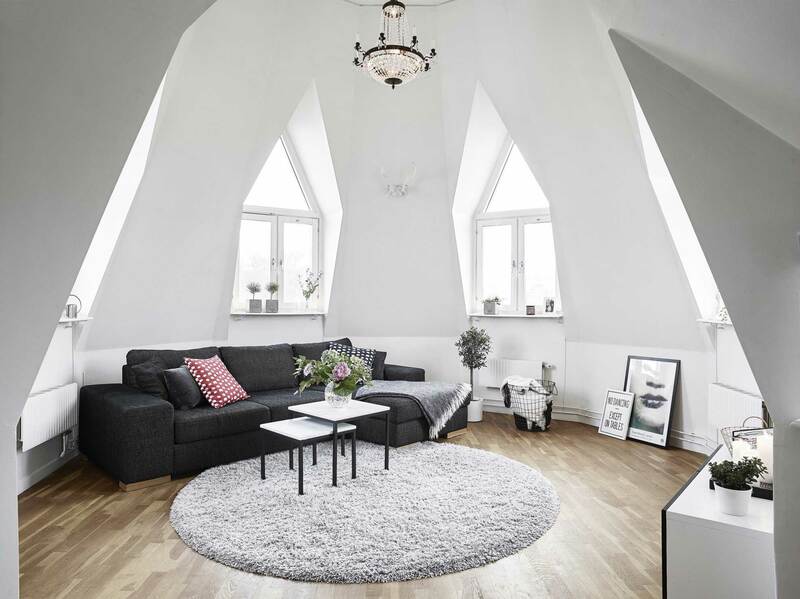 The crisp white palette ruling the interior reveals the interesting architectural quirks that make this attic apartment unique. Steep sloped walls rise up to a high ceiling, and are cut away to accommodate large windows through which natural light streams in and brightens up the entire open-plan residence. Colorful cushions and rugs sprinkled against the white background are charming accents. A stylish living area. The large space is designed in a stylish combination of white and natural wood creating a luxurious and welcoming ambiance. The room is crowned by a high domed ceiling revealing structural wooden beams and featuring a massive iron chandelier.